Although it only has four simple ingredients (hint, there's no gelatin) this ultra-creamy Panna Cotta melts in your mouth like butter. It’s the best way I’ve found for making this popular Northern Italian dessert. Panna Cotta literally means “cream cooked” in Italian, and although it’s often positioned as a traditional Northern Italian dessert, all evidence points to a rather short history. The first mentions of the dish didn’t start appearing in Italian cookbooks until the 1960’s. Although its exact origins remain murky, it’s likely that it evolved from other egg and cream based custards widespread across Europe. Panna Cotta – Custard or Gelatin? Although Panna Cotta generally set with gelatin, it’s always struck me as odd that despite the name implying that the dessert is cooked, it’s not (the cream is just heated to melt the gelatin). A few weeks ago, I had a delightful lunch cooked by a chef trained in Northern Italy. He insisted the proper way to make Panna Cotta was without gelatin, and it was indeed the best version of this decadent dessert I’ve ever had. For all it’s magical gelling powers, gelatin has two big weaknesses. The first is that it can be a bit finicky to work with; heat, acidity, and sugar content can all affect how well gelatin sets (or doesn’t set). Making matters worse is the fact that there are so many different types of gelatin, it’s hard to say just how much of any one type to add. That’s why most recipes call for way more gelatin than needed, which makes the Panna Cotta hard. The other problem is that gelatin literally stinks. High grade gelatins take measures to mitigate the smell, but the majority of commercial gelatin tastes like the skin and hooves it’s made from; not a flattering taste for this delicate dessert. Using egg to set the Panna Cotta solves these problems, by using barely enough egg to set it. The resulting custard is silky smooth with a texture that’s like warm butter (it melts on contact with your warm mouth). Eggs themselves can have a sulphuric odor to them, but by using just the egg whites, you’re not only able to keep the Panna Cotta snow white, but it also doesn’t taste eggy. 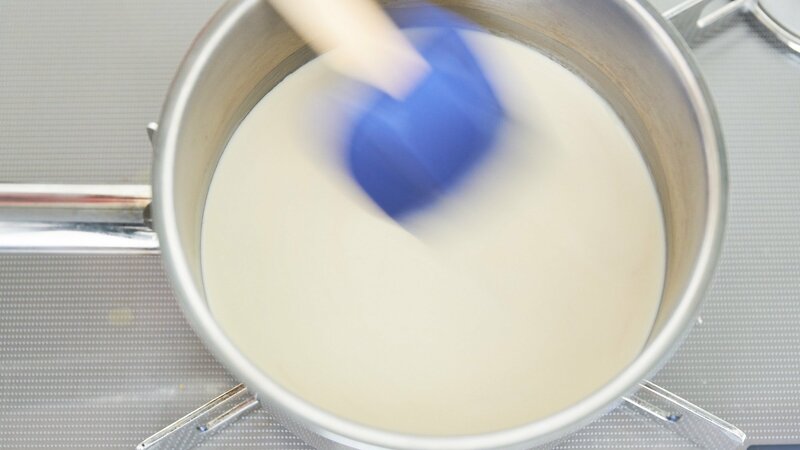 Air bubbles will ruin the texture of your Panna Cotta, so the tricky part is beating the custard mixture enough to ensure the egg whites are evenly distributed, but not so vigorously that you whip it into a foam. I’ve found a few pulses of a hand blender fully submerged in the custard mixture works best. Then I pass the mixture through a fine mesh tea strainer to remove any bubbles that do develop. For me, what sets Panna Cotta apart from other custard-like desserts is that it’s first and foremost about the cream. That’s why I like using cream with the highest butterfat content available. Here in Japan, we have cream with 42% butterfat. In the US “Heavy Cream” is supposed to have at least 38% fat so that would be your best bet. 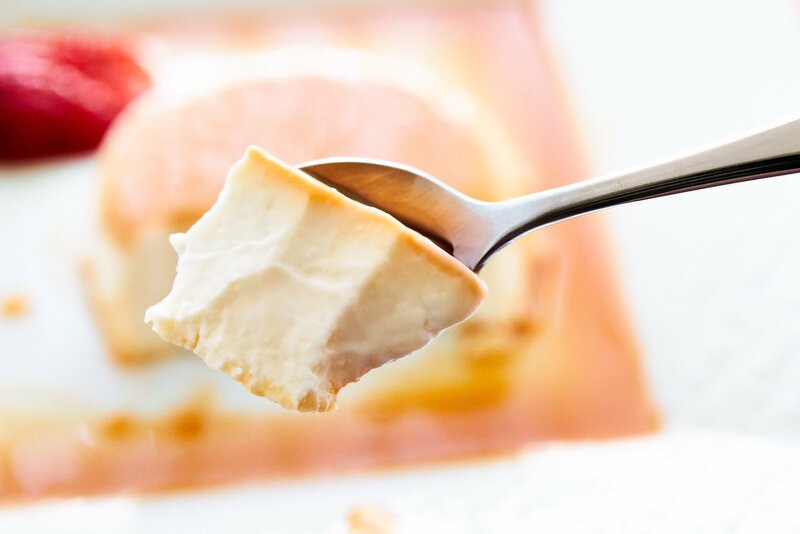 While I love a tangy sweet fruit coulis to go with this rich panna cotta, there’s something magical about adding a layer of almost-burnt caramel to the bottom of ramekins and watching the hard candy turn to liquid gold by the time you unmold it. If you go the fruit topping route, skip the caramel and serve the Panna Cotta in the ramekin topped with your favorite fruit sauce. The trick with the caramel is to get it as dark as you without making it bitter. This is easier said than done, as carry-over cooking will make the caramel continue to rise in temperature even after you’ve removed it from the heat. 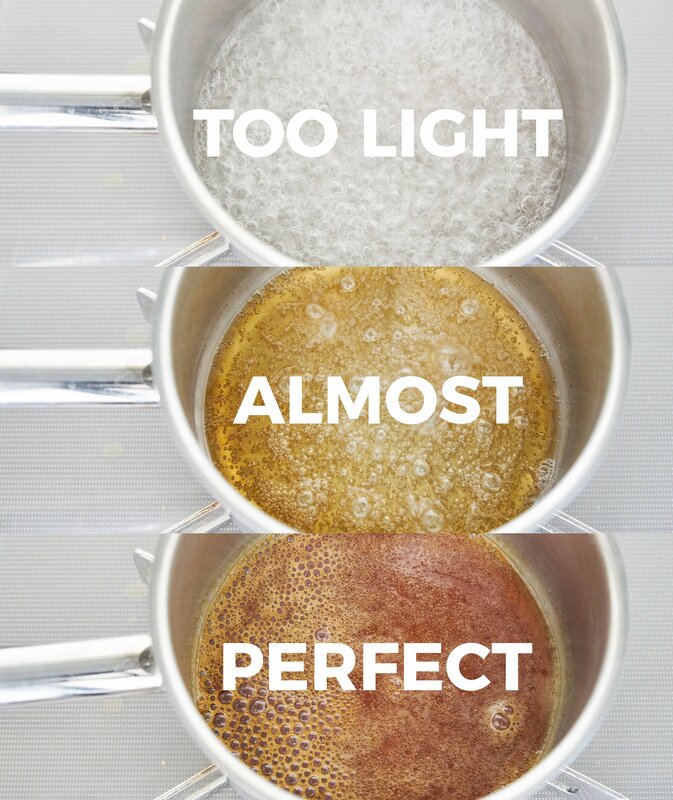 The best solution for this is to add a small amount of water to the caramel when it’s reached the perfect color, which quickly lowers the temperature. Preheat the oven to 280 degrees F (140 C). Prepare a tray with 6 six ounce ramekins. 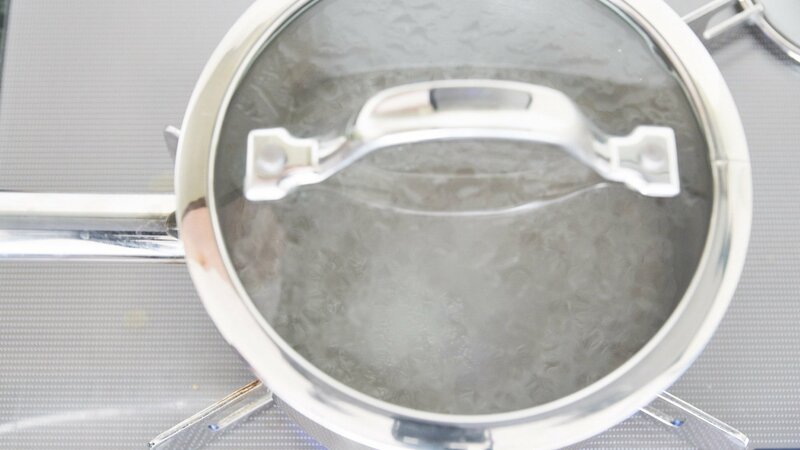 Add 3 tablespoons of water to a pot with a lid and then add the sugar into the middle of the pot. Cover with a lid and bring the mixture to a boil. Continue to boil with the lid on until the sugar has completely melted. Once the sugar has melted remove the lid and and start measuring the temperature. You can stir it at this point if you need to. 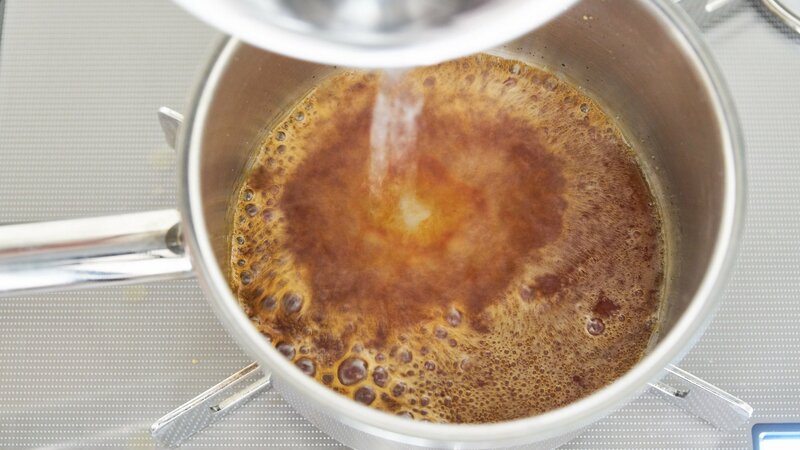 When the caramel reaches a medium brown color (350 degrees F), remove the pot from the heat and quickly and carefully pour 2 tablespoons of room temperature water into it, whisking to combine. Be very careful as the hot caramel will sputter. 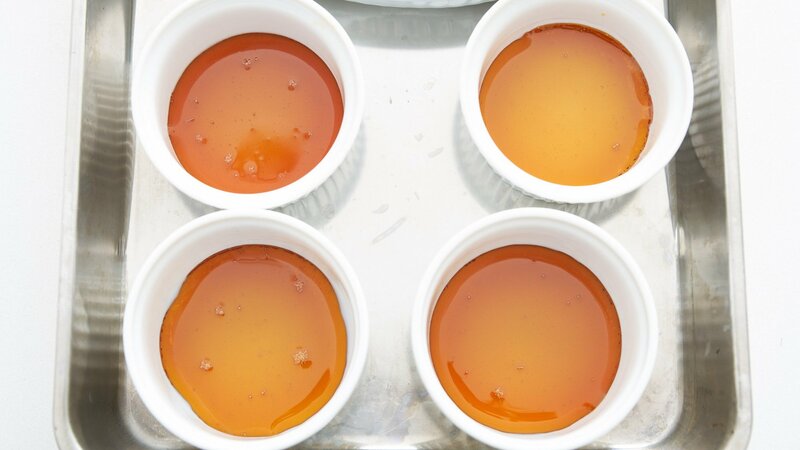 Divide the caramel between the ramekins. 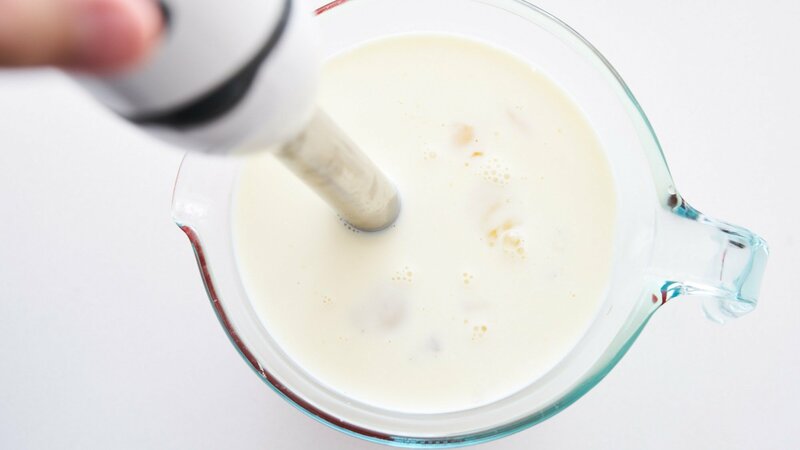 To prepare the custard for the Panna Cotta, put the cream, sugar, and vanilla in a pot and heat, stirring until the sugar has fully dissolved (don't let the mixture boil). Remove the pot from the heat and let it cool to lukewarm. You can use an ice bath to speed this up. 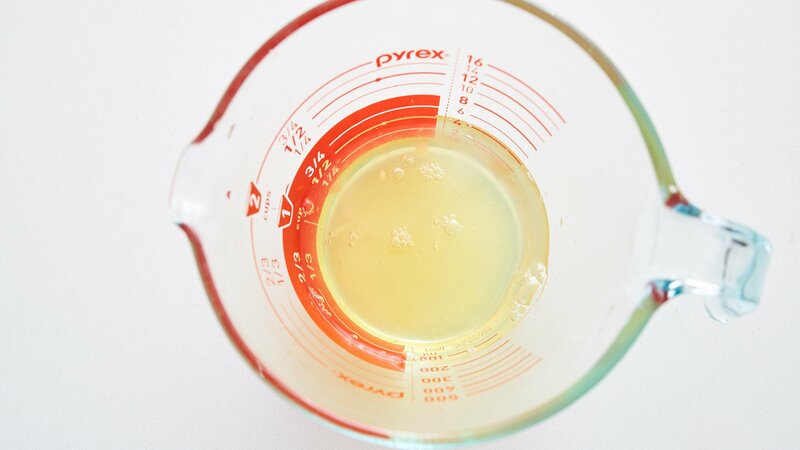 While you're waiting for the cream to cool, measure out the egg whites into a tall liquid measuring cup. If you don't have one, you can use any tall container your hand blender will fit in. Once the cream has cooled, pour the cream mixture into the egg whites. Stick the hand blender in the mixture and swish it around a bit without turning it on to remove any air trapped near the blades. With the blender fully submerged, pulse until the mixture is homogeneous. The idea is to mix evenly without incorporating any air. Divide the Panna Cotta custard between the ramekins and pour boiling water into the tray halfway up the sides of the ramekins. 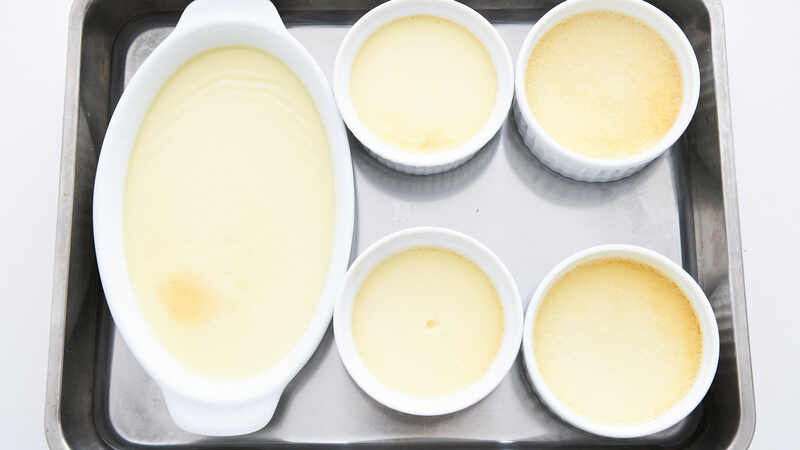 Carefully put the tray into the oven and bake for 30 to 40 minutes or until the custard has reached 163 degrees F (73 C). Let the ramekins cool, cover and refrigerate until set. 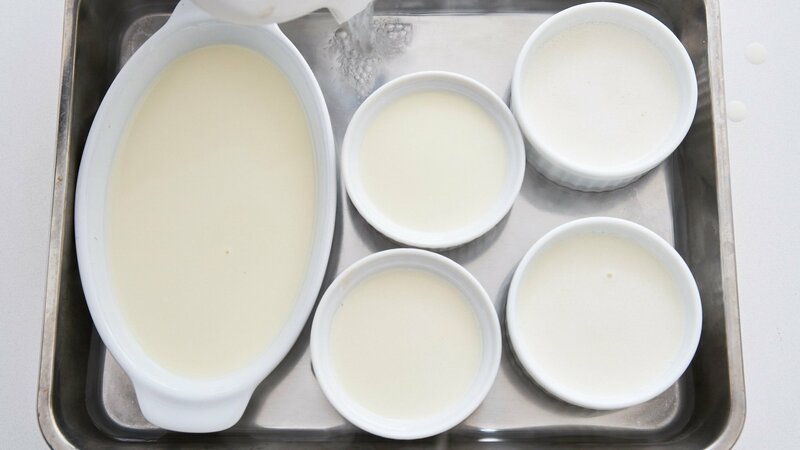 Run a hot paring knife or needle around the edge of the ramekin to separate and then unmold the Panna Cotta onto a plate. So basically panna cotta is caramel custard? Panna cotta is the custard. Caramel is an optional item. 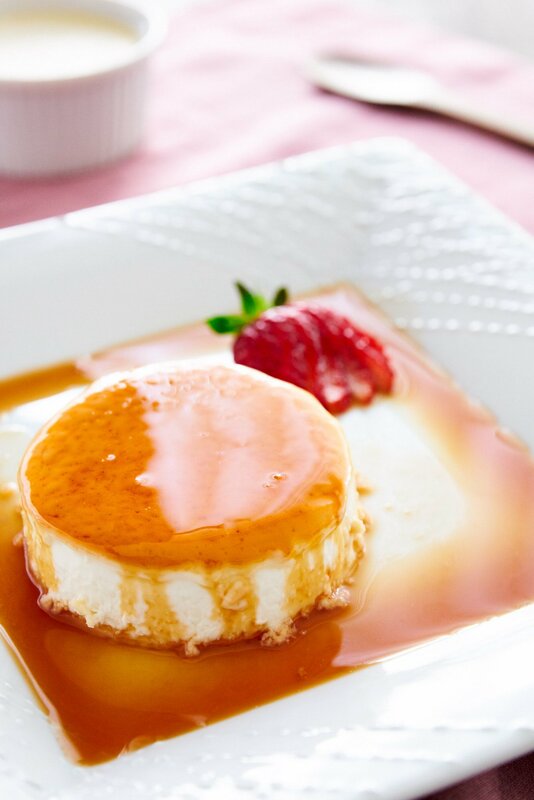 For instance, some panna cotta are topped with a fruit sauce, while others have no topping at all. The taste is quite different as this does not include the yolks (which gives caramel pudding an eggy taste). 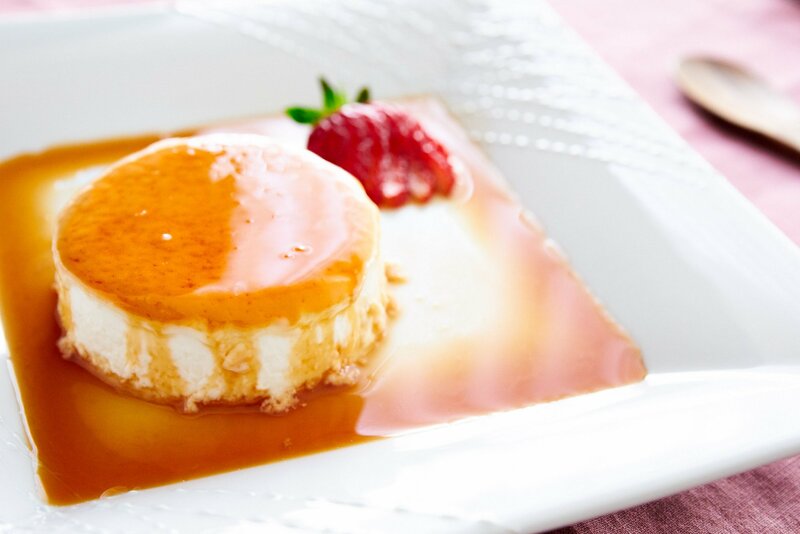 The use of cream also makes it much richer (closer to a pot de creme than a creme caramel). Has anyone flavoured the Panna Cotta with a fruit? If so how was this recipe modified? Fabulous. Thanks for the tips. Made this last night, refrigerated it overnight and family are raving after dessert tonight. I used light cream instead (to try and be healthier! ), and the result was still very tasty. Topped it with fruit and drizzled honey. Agree that using egg white alone does provide significant distinction from the taste of custard. Hi Megan, I’m so glad to hear that you and your family enjoyed it! Thanks from stopping back by to let me know!